Prior to the use of the Cerro Colorado Landfill, the City of Albuquerque, Bernalillo County and private landowners operated several other landfills in and around Albuquerque. Though these landfills are now closed and have not accepted trash for some time, there is still a great deal of action taking place onsite. Landfills located in arid climates such as Albuquerque’s can create landfill gas for decades after being closed. These gases along with other products of decomposing landfills are potentially explosive and can impact water quality and health in addition to creating strong odors. The Environmental Services Division within the Environmental Health Department monitors these older landfills for gas generation, gas migration and groundwater contamination. Additionally, the Environmental Services Division recommends safety measures for development on and near these closed landfills (see Interim Guidelines for Development near Landfills). The Environmental Services Division works with the City of Albuquerque Planning Department to ensure that areas near old landfills are developed safely according to the guidelines. The Environmental Services Division also initiates remediation work for landfills that pose a risk. Some of these remediation measures include groundwater treatment and landfill gas collection. The map below provides locations of all known closed landfills in the Albuquerque metro area. The map also provides the buffer zones for all of these landfills. Each individual landfill can be selected for more information about the selected landfill. Contact information is provided for landfills that are not managed by the City of Albuquerque, Environmental Health Department. 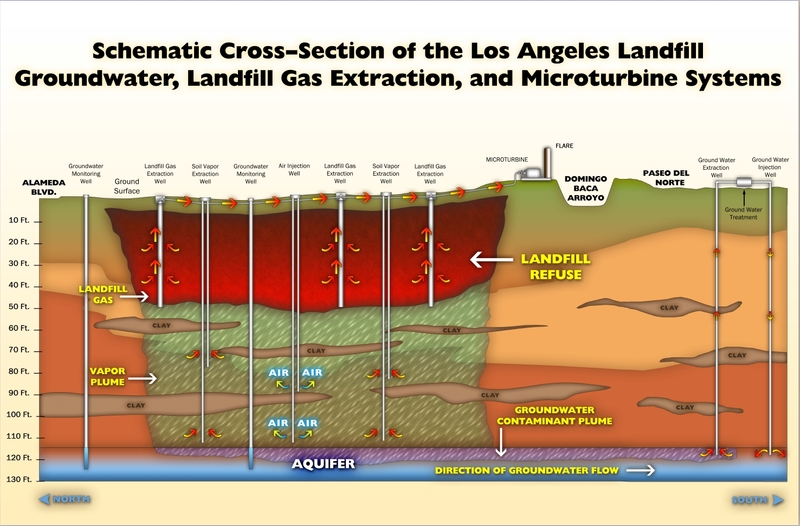 Below is a schematic of the now closed Los Angeles Landfill which is located south of Balloon Fiesta Park. This diagram depicts the extraction system collecting landfill gas from the waste whereby it is pulled to the flare and burned along with other pollutants that have migrated out of the unlined landfill. The flare decreases greenhouse gas emissions in addition to destroying some of the hazardous pollutants being removed from the landfill. This drawing also shows the groundwater treatment system the Environmental Services Division was installed in order to combat contamination that could potentially reach the groundwater.